This dairy free vanilla ice cream recipe is a classic and is so delicious that you won’t even miss the dairy! This recipe is perfect to have on hand for those who have food allergies and it is so simple and easy to make. I love ice cream – pretty much any flavor, non-dairy or dairy. However, I rarely buy it because most commercial ice creams are filled with so much junk. Even the organic and all-natural brands still have certain ingredients that I don’t like. So, that’s why I invested in a Cuisinart ice cream maker (it was on clearance at Sur la Table) and it has gotten a lot of love! 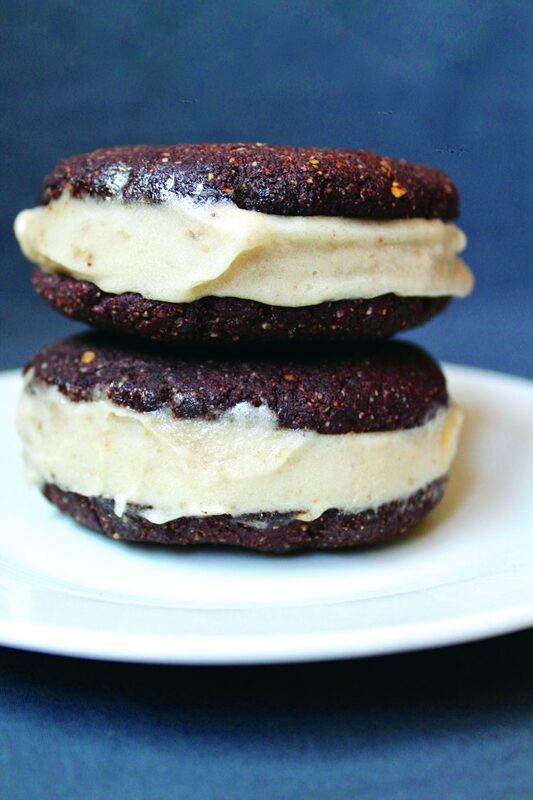 Here is a simple and delicious non-dairy ice cream. Perfect by itself, or on top of bananas foster or mixed fruit cobbler. 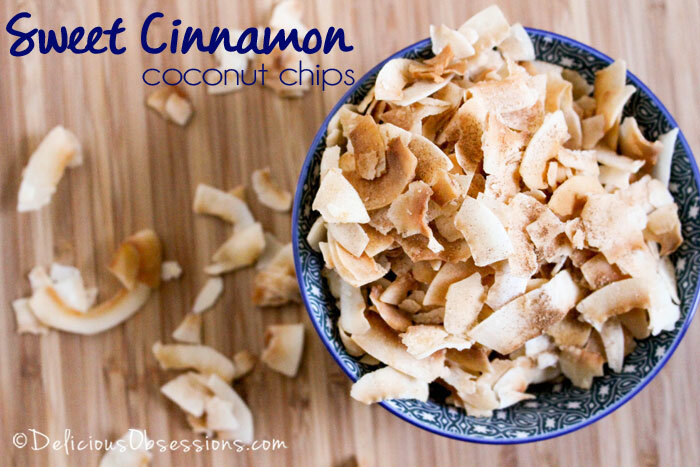 Even better, try it with some coconut oil Magic Shell drizzled over the top and get your daily dose of coconut oil! Yum! 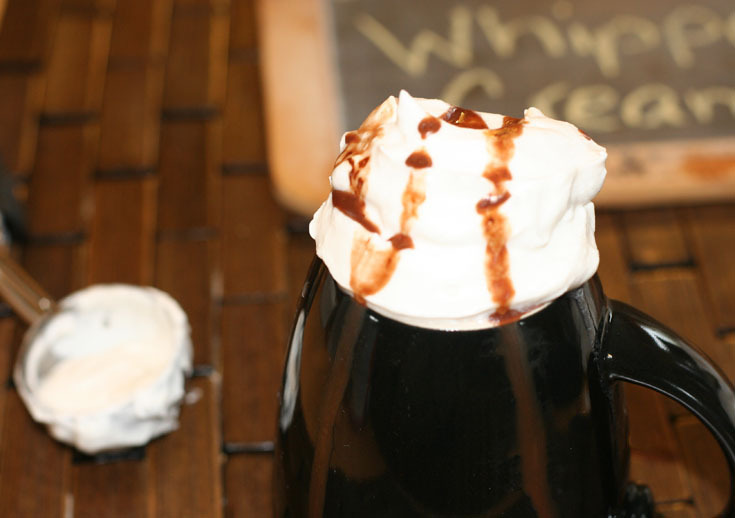 Feel free to add other flavors or mix-ins to this recipe. You could customize it any way you like. Enjoy! 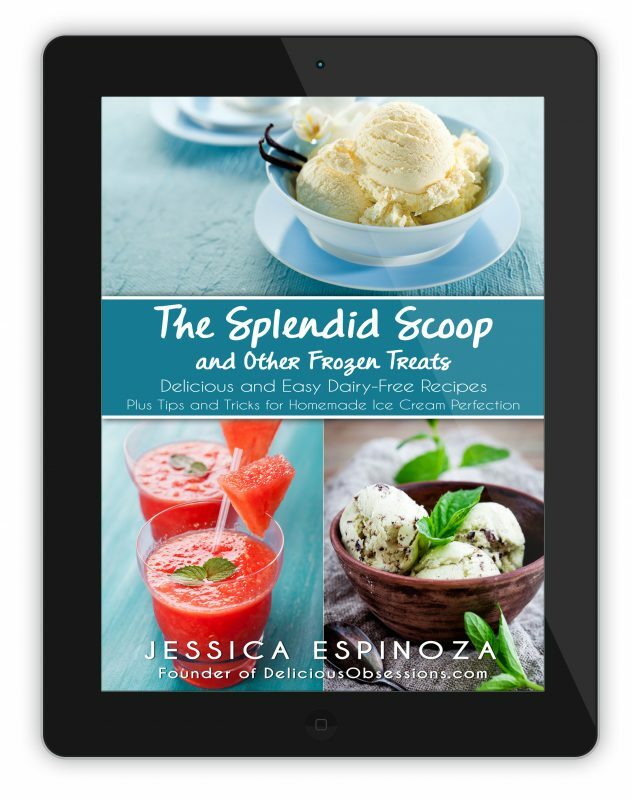 Intimidated by the thought of making your own ice cream at home? Don’t be! It’s so easy and here are 5 Tips for Perfect Homemade Ice Cream. NOTE: People seem to freak out because I’ve included raw egg yolks in this recipe. If you don’t want to eat raw eggs, then don’t. I ONLY eat raw eggs when they come from a source I trust, like my parents (who raise chickens) or a local farmer that I know and trust. I would NEVER eat commercial eggs raw. So, if you don’t have a safe source for eggs, you can either omit them, or heat the mixture over very low heat to pasteurize the eggs before making the ice cream. Chill completely, at least 6 hours, or overnight. I found a similar recipe that used 1 can coconut milk, 1/3 C PB, 1/3 C sweetener, and vanilla. I doubled the recipe and only used 1/3 C sugar, plus about 1/2 tsp white stevia powder. The whole family loved it. Yum! 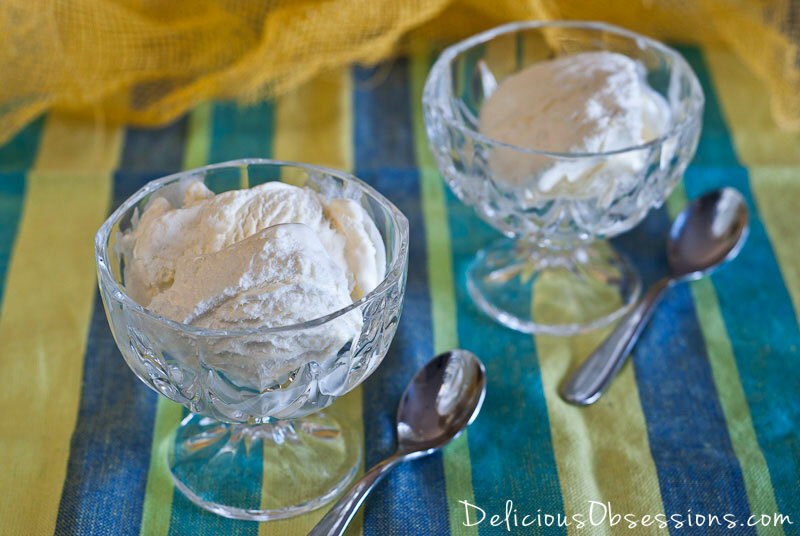 I LOVE homemade ice cream and it’s fun to experiment with different “milks”! How is this dairy free is the first ingredient is eggs?! I think your recipe may have a misprint – pasteurized eggs, when you might mean pastured, organic eggs. Also, should the ingredients be cooked as the yolks would make a creamy custard then. For the posters who queried the “dairy-free” status – DAIRY means is comes from a cow. I know some people are confused by this because eggs are often sold in the dairy section of a grocery store. I never cook my egg yolks when I make ice cream. I used to keep my own chickens, so I knew how great the eggs were, but I have another great source of pastured eggs now. I wouldn’t necessarily do this with supermarket eggs. How do you pasturize egg yolks? Does this recipe make a creamy ice cream? I have tried a few recipes with coconut milk and just can’t seem to get it creamy like a dairy ice cream! Hi Katie – I find the ice cream to be creamy, especially if you use an ice cream maker. I think the eggs really help improve the body and texture of the ice cream. Hope you enjoy! Can I sub cashew milk for coconut milk? Re the eggs question, as someone has previously mentioned, eggs are definitely NOT dairy. Dairy comes from a cow, a dairy cow on. a dairy farm. Eggs come from a chicken. Eggs are in the protein food group. PS LOVE the recipe :)!! First of all thank you for all of your thorough info. I’m into this big time and it is always a testament to someone else when I learn something new. My question is: I made ice cream last night (raw milk) using Megan Stevens (Eatbeautiful.net) recipe. I love her but it came out icy. I have a fancy new Breville ice cream maker so I know its not that and I followed your instructions too. Is it the maple syrup (too much liquid) or the fact that you do not “cook” the mixture first that made it icy. In other words, how do you make really creamy ice cream? You can always egg extra yolks for extra creaminess (and nutrition). I think my record was 13, and it was delicious. yes that is what i thought. i LOVE good fats and we eat dairy so raw cream it is with super fine organic sugar (of some sort) and yes, i am ordering the book.